Summon your treasure box minion. 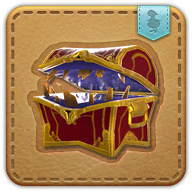 It is unknown what manner of spirit possesses this tiny treasure chest, but the fact that it will not hesitate to nip at the fingers of any who try and pry it open is painfully evident. Originally used by an Eorzean Alliance paymaster to store Allied Seals...until the box began eating them. She sold the box in hopes of recouping some of her losses (skimming off adventurer rewards to cover the rest...until she was caught and sentenced to a public flogging). Delivers an attack with a potency of 120 to all enemies within range while increasing action party ATK by 20.